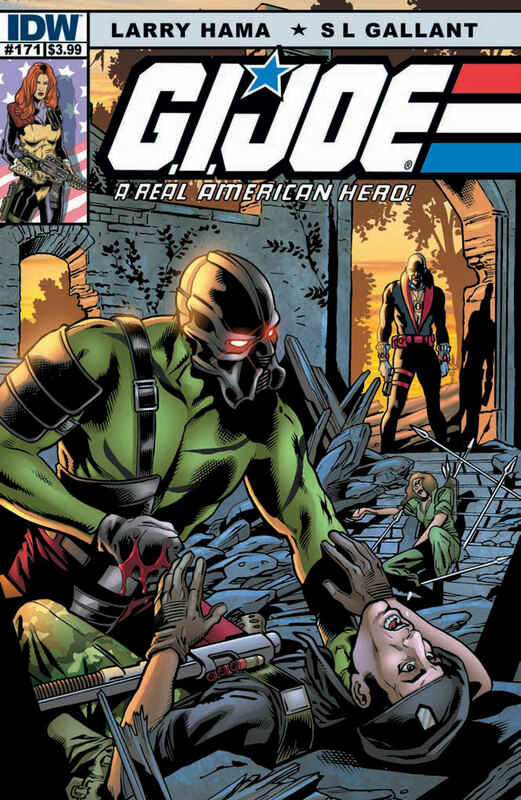 Written by Larry Hama and art by S. L. Gallant, G.I Joe: A Real American Hero #171 follows Flint, Lady Jaye, and Roadblock on their mission to extract Darklon from his own country, while Sneak Peek debriefs Chuckles about his whereabouts for the last couple years. G.I. Joe, A Real American Hero #171 is one of the most well-written stories to come out since the relaunch of the series. Hama is back to his classic trick of weaving multiple plots threads together throughout the book, including the appearance of a new Arashikage splinter group at the end of the issue. What really makes this stand out is the perfect juxtaposition to the two main plots: the escalading pace of Darklon extraction and Sneak Peek’s recount of his last couple years in undercover surveillance, and how the reader slowly discovers how intimately the consequences of one story ties into the other. Hama teases us with not one, but two cliffhangers, including a powerful dilemma over one’s duty to a mission and one’s personal feelings for a close friend and comrade. Hama’s writing skills notwithstanding, a big reason why A Real American Hero is the favorite among the various IDW’s Joe titles is that for many of us, Hama defined the personalities of these characters. Twenty years later, he continues to tap that same well. Each character in the book has their own distinct voice, a voice that is consistent with how the characters looked and acted during the height of the Marvel series popularity and critical acclaim. The character with the most development this issue is undoubtedly Sneak Peek. His part of the story was largely narrative and light in action (in contrast to Flint, Lady Jaye, and Roadblock), but he quickly becomes a sympathetic character, and (ironic considering his specialty) we can easily see and experience his story through his eyes. An acquaintance of Sneak Peek’s, Katya, is fleshed out and given an important role in this book. Although the plot involving her has finished this issue, considering Hama’s history of reusing foreign nationals, I wouldn’t be surprised to see her show up in future issues. S. L. Gallant continues to show strong work in this series. While occasionally his style can be a little cartoony, he has a good eye for detail, and a great skill at sequential art that makes the book flow well. There were a couple of stand-out panels during the Sneak Peek’s arc in which there was no dialogue or captions. Gallant’s depiction of Sneak Peek’s facial expressions and actions spoke greater volumes about what was going through his head than any words could have done. A special acknowledgement must be paid for the colorist in this issue, J. Brown. Considering that the two major plots took place largely in Darklonia, the rapid jumping between them would have been confusing. Brown’s muted colors and shading for the night mission and Darklon’s headquarters not only lent atmosphere, but also clarity, to the story. It was an interesting choice for the Darklon extraction team (Flint, Lady Jaye, and Roadblock) considering which characters appear to be headlining the upcoming Retaliation film. Heck, there is even a guest appearance of G.I. Joe Colton in this issue! VERDICT A Real American Hero #171 continues to deliver the type of story that long-time comic fans have grown to expect and love from Hama. He appears to be hitting his stride with this series, and each issue is better than the last. Very highly recommended.